"A man who has not passed through the inferno of his passions has never overcome them. They then dwell in the house next door, and at any moment a flame may dart out and set fire to his own house. Whenever we give up, leave behind, and forget too much, there is always the danger that the things we have neglected will return with added force." In the midst of a conversation with my girlfriend the other day, the subject of which escapes me now, I was led to pick up an old favorite book of mine from the bookshelf and talk a bit about it to her. 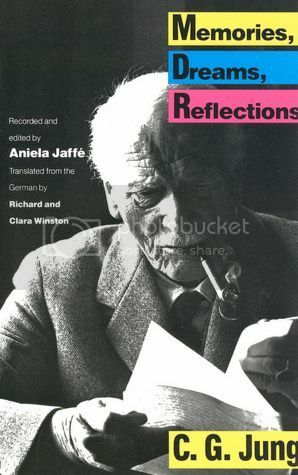 The book was Carl Jung's autobiography Memories, Dreams, Reflections. I went through a phase of closely studying Jung's writings and nothing came close to the powerful impact of that book. A highly influential psychologist with stacks and stacks of fresh ideas and insights, Jung never seemed to go deeper than he does in this book. As is perfectly fitting for the man who coined the term "synchronicity," Jung's book suddenly popped up in my atmosphere again that same night as I was reading a recently-discovered blog called Brain Pickings. Seemingly out of the blue, there was Jung's Memories, Dreams, Reflections at the top of the page with a little blurb and even an illustrated diagram summarizing the book's story. This, of course, prompted me to start piecing together ideas for a blog post and I faintly remembered taking copious notes on the book when I had first read it in early 2009. It was in November of 2009 that I initially started writing this blog, but before I ever decided to start sharing my own thoughts on the internet I had been practicing my writing privately in notebooks for a few years. Digging up my old notes for Jung's book I came across not only a dozen or so pages worth of quotes I had copied down from it, but even a thorough, glowing 8-page review I wrote for it. Looking back at the review, I'm glad to see that I meticulously documented the strong effect the book had on me because I've only read it once but I recall that it struck me powerfully. As I wrote back then, "Upon first rendering, it's a glorious flash of light but it is necessary to approach the material again and sit in its glow for a time. This is extremely powerful, illuminating stuff." "Apparently, the souls of the dead 'know' only what they knew at the moment of death, and nothing beyond that. Hence their endeavor to penetrate into life in order to share in the knowledge of men. I frequently have a feeling that they are standing directly behind us, waiting to hear what answer we will give to them, and what answer to destiny." That sounds a little spooky or perhaps even a little bit silly. It is true that Jung had a major falling out with his early mentor Sigmund Freud because of such paranormal matters. It is also quite true that Freud was far too narrow-minded and dogmatic by the time Jung came into his life. This book tells the whole story of Jung and Freud's relationship but it's only after that early chapter that the story starts to really take off. To put it in very rudimentary terms, Freud never went deep enough. He was entirely focused on what Jungians call the personal unconscious, which is basically the entire galaxy of memories and experiences from someone's life. Perhaps Jung's greatest contribution to the knowledge of humanity is his idea of the collective unconscious, the unfathomably vast and deep layer that rests underneath (so to speak) the personal unconscious. This is the realm of ancestral experiences, archetypes from the earliest stages of human evolution (if not somehow before that), the body's consciousness, the species' consciousness. It is a realm of timelessness, when you get right down to it. For all we know, there is no beginning to our psyche. It goes all the way down to the earliest forms of life which emanated from the earth which emanated from the sun which emanated from the remains of other exploded suns which emanated from the remains of the early universe which emanated from the remains of... see what I mean? "It is of course ironical that I, a psychiatrist, should at almost every step of my experiment have run into the same psychic material which is the stuff of psychosis and is found in the insane. This is the fund of unconscious images which fatally confuse the mental patient." "But it is also the matrix of mythopoetic imagination which has vanished from our rational age. Though such imagination is present everywhere, it is both tabooed and dreaded, so that it even appears to be a risky experiment or a questionable adventure to entrust oneself to the uncertain path that leads into the depths of the unconscious." This idea of the fractured relationship between man and his symbols is a main theme in Jung's work and especially in this book. What follows his "Confrontations with the Unconscious" is a detailing of his writings and theoretical explorations that sprung from his new insights into this murky realm. The "Confrontations" chapter is perhaps the greatest part of the book and yet it also a major turning point after which things get a little weird. Much of it is hard to believe except for the fact that Jung was so serious about his work. As much as some of it may sound like New Age gibberish to the modern mind, this is the life's work of one of the greatest scholar-physicians in modern history. The following chapter (the book is written mostly in chronological order covering the events of his life) details his travels around Africa, Asia, and America with plenty of great material along the way. Once he returns, we get the strangest chapter of the book detailing a wild hallucinatory episode in Jung's life that occurred when he broke his foot and then had a heart attack in quick succession. These personal disasters lead to vivid experiences of delirium and visions as he approaches the brink of death. Most of this chapter is recounted in Stanislav Grof's excellent book The Ultimate Journey: Consciousness and the Mystery of Death. What I found most striking about this whole episode was the new perspective Jung had on life once it was all over. Page 297 details this in beautiful passages that seem to perfectly coincide with the main message of James Joyce's books: an affirmation of life. I think I've already offered plenty of praise for this book and thus you should by now realize the richly rewarding reading experience one gets from it, so I will here close with one of my favorite passages. "Something else, too, came to me from my illness. I might formulate it as an affirmation of things as they are: an unconditional 'yes' to that which is, without subjective protests---acceptance of the conditions of existence as I see them and understand them, acceptance of my own nature, as I happen to be. At the beginning of the illness I had the feeling that there was something wrong with my attitude, and that I was to some extent responsible for the mishap. But when one follows the path of individuation, when one lives one's own life, one must take mistakes into the bargain; life would not be complete without them. There is no guarantee---not for a single moment---that we will not fall into error or stumble into deadly peril. We may think there is a sure road. But that would be the road of death. Then nothing happens any longer---at any rate, not the right things. Anyone who takes the sure road is as good as dead. It was only after the illness that I understood how important it is to affirm one's own destiny." A lovely, thoughtful post. I've been through a Jung period myself, though I have to say it's been more filtered through the Jungians than actual contact with the source material. I think my main entrance though was through a biography written by Laurens Van der Post, and one of the things that stands out for me was his initial resistance to his ideas, and then his fairly complete embrace of them. I believe it was Walker Percy who led me to become a bit disillusioned by Jung, the man. It's a bit unfair of me to mention this as I can't at the moment dredge up the relevant details. I believe it was probably a political stance he took. Anyway, that probably has little to do with the inner journey and I'm remiss not to have read Memories, Dreams, Reflections at some point in my life. Joseph Campbell led me directly to the source material as he edited and introduced the collection called "The Portable Jung" which really introduced me to much of the Swiss doctor's material. Nothing I've read of Jung's come close to "M,D,R" as far as readability though. The psychological essays and books can get dry and boring easily. Had never heard of Percy until now. Looks like an interesting writer. As for that disillusionment: the more figures I study and chisel onto my mental Mount Rushmore, the more figures I find who have SOMEthing (inevitably) that I strongly disagree with. I try not to let it force me to dismiss them in entirety. We have a copy of the Red Book at the store. We sell one at a time. I haven't really looked at it, except upside down over the shoulders of customers. Again, remiss. I believe I read that book of Singer's or some parts of it some time ago. Not sure what I retain of it, though. There is a piece on Freud's Talking Cure in the Opinionator column of the NYT. It's good and seems at least tangentially related. It's here if you aren't up against a pay wall. I think it might be his last novel, The Thanatos Syndrome, where he gets after Jung, but I would read his non-fiction stuff, Message in the Bottle and Lost in the Cosmos to get a sense of his thought.